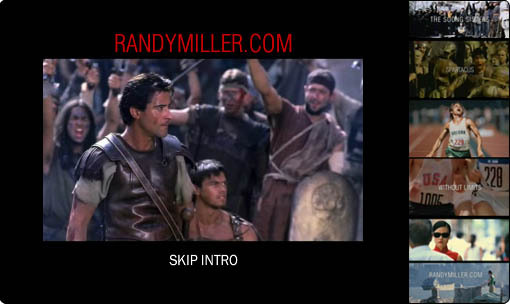 American music composer, Randy Miller, contacted me to develop his website to showcase his various projects to film directors and producers. His website included a 30-second motion graphic introduction, news updates, biography, a personal image gallery, printable biography, and a full portfolio with sounds, images and video. Randy Miller’s credits include films such as The Soong Sisters, Spartacus, Amargosa, Without Limits, Go Tigers!, Shanghai Red, Irish Eyes, and credits with Warner Brothers, Showtime, Disney, ABC Movies, USA Networks, and Sci-Fi. 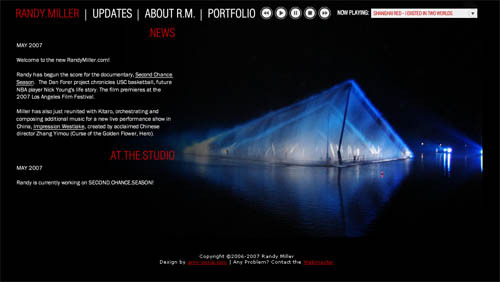 American music composer, Randy Miller, contacted me to develop his website which included a 30-second motion graphic introduction that showcased his work, and highlighted him as a film scorer. This video includes footage of films such as The Soong Sisters, Spartacus, Without Limits and Shanghai Red. You can view the alternate first version of the introduction here, and the original final version. 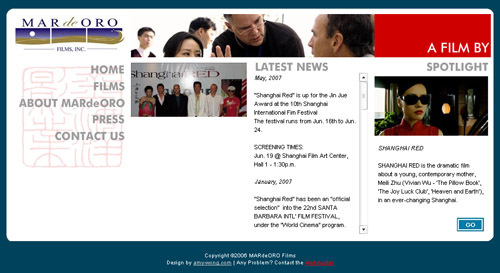 Thanks to the opportunity to work on Shanghai Red, MARdeORO Films decided to hire me to re-design their official website right on time for the release of their first feature film at Cannes Film Festival! Working on this project gave me a bit more freedom with the style, the look and the feel of the website, so it was somehow a bit more fun to work on. I wanted to give MARdeORO Films a little bit of a contemporary look, with a little bit brigther colors and creating more contrast, which resulted in me playing around with colors and shapes. 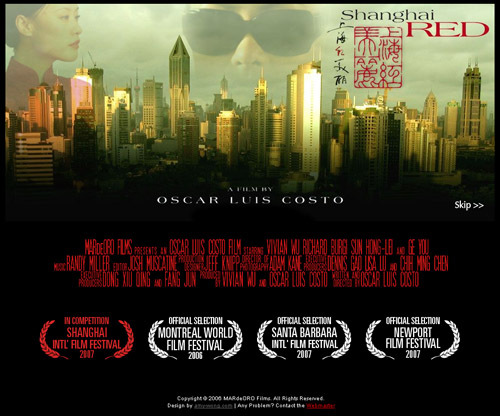 After collaborating in the Eve & the Fire Horse website, I was contacted by Vivian Wu’s recently founded film production company to see if I could make a website for their first feature film, Shanghai Red. The challenge of this project was working in the website for a movie that I hadn’t seen. I was given the movie script, and had read it to give me a basic idea of what the movie was about. However, the only visual aid I had was the stills from the movie and the trailer. Working independently in this project was a huge challenge for me because I was in charge of everything that was going on, from contacting the client and making sure they were satisfied with the progress of the website, to developing the code and designing the look for it. Because of the constant contact that I had with Vivian herself, I managed to finish the website in about one week and half, giving me time to work on my next project with them. 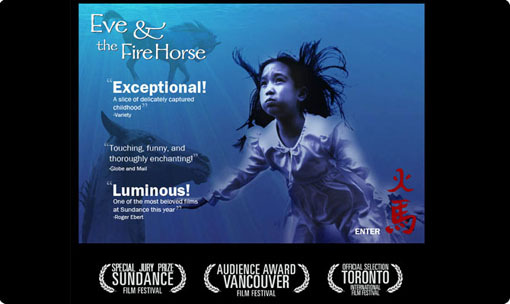 I was contacted not long ago by producer Yves Ma on behalf of Golden Horse Productions, to develop a simple website for the Canadian-HongKong production of Eve & the Fire Horse written and directed by filmmaker Julia Kwan, and starring Vivian Wu (The Last Emperor, Joy Luck Club, The Pillow Book). I was the producer of the website, and put together a team of 5 people (including myself) to develop this project in around a week. The team, composed by Jung-Kit Chan, Maggie Hui, Nathan Chow, Irene Jung and me. We worked hard to put all the material together, while I was also in constant communication with the producers, as well as being the Technical Lead for the project. I also contributed visually. During the time we were working on the project, we also worked in a few new posters for the movie, which unfortunatelly didn’t make the cut.